A large stoneware bowl, the sturdily potted body supported on a low foot, the rounded sides straightening slightly towards the rim. 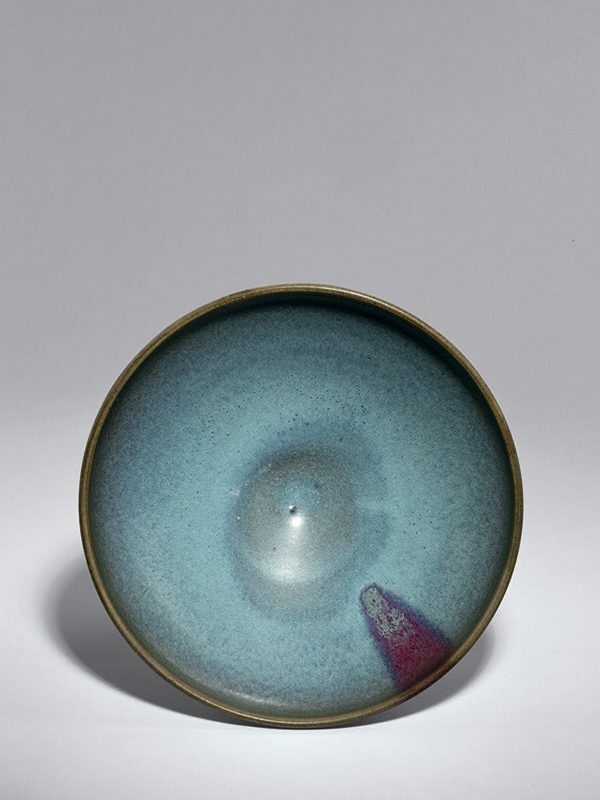 The bowl is covered in a lustrous sky­-blue glaze, which is enlivened by a splash of purple that extends from the rim to both the upper parts of the interior and the exterior of the bowl. The glaze has tiny air bubbles that speckle the smooth finish and stops well short of the unglazed foot, where the light orange coloured body is visible. 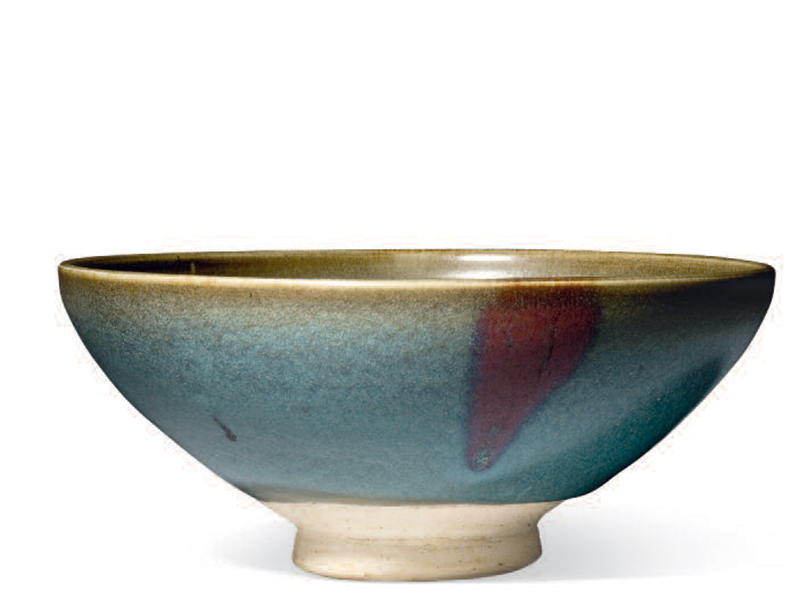 The thick body and lustrous sky­-blue glaze of this bowl are characteristic of jun ware. As Krahl observes, while Jun wares were later classified as one of the five classic wares of the Song, which also include ru, ge, guan and ding ceramics, the lack of its referral in any pre-­Ming texts has caused much debate amongst scholars as to the precise dating of certain types of jun ware. The somewhat heavier potting and darker blue tone of the present bowl indicates that it was probably made later than the Song dynasty. A similar jun stoneware bowl of slightly larger size and comparable in the blue­-and-­purple glaze and the orange-­coloured body, is in the Meiyintang Collection and dated to the Yuan dynasty, 14 century. Another example similar in size, the colour of the glaze and dated to the 13th ­ 14th century, is in the Robert Lehman Collection at the Metropolitan Museum of Art. A Yuan dynasty jun stoneware bowl comparable in the bluish glaze with a purple splash is in the collection of the National Palace Museum in Taipei. A further comparable jun bowl similar in colour, shape and size, dated slightly earlier to the 12th 13th century, is in the collection of the Victoria and Albert Museum.